I was a Direction-Finding (DF) operator on the PATHFINDER Caribou RCV-2B, Tail No. 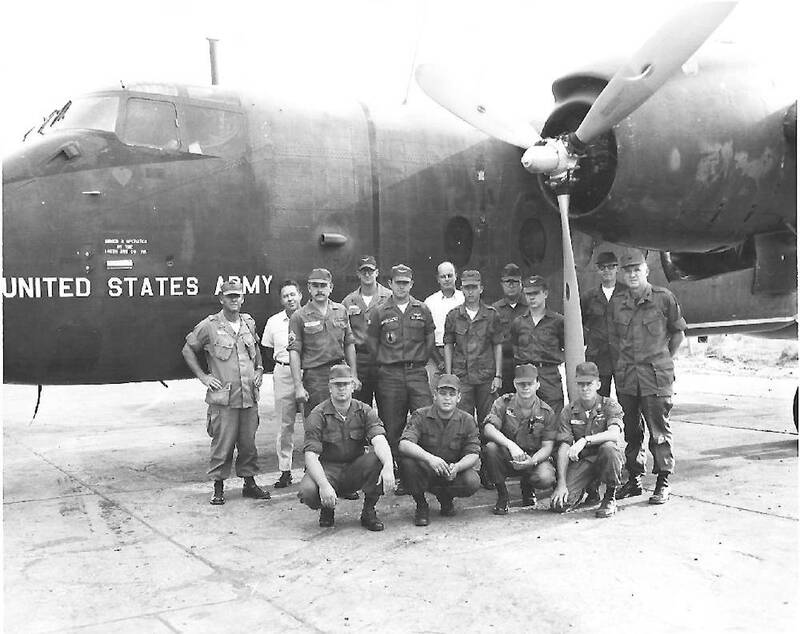 62-4147 assigned to the 509th Army Security Agency (ASA), 146th Aviation Battalion, 3rd Radio Research Group in Vietnam from 1966 to 1967. I recall this additional information to what Richard M. McCarthy described in his account below of the Caribou's battle damage, as follows. 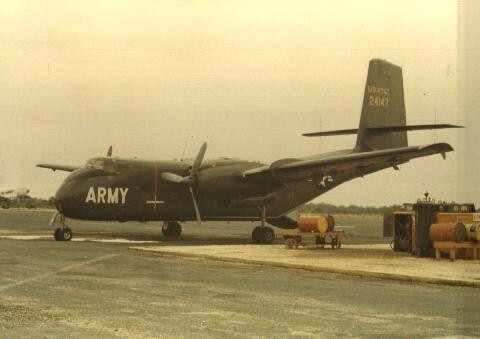 On Sept. 20, 1966, our PATHFINDER Caribou 62-4147 was performing an intelligence intercept operation over North Vietnam, slightly north of the DMZ, at about 5,000 ft. altitude when we started to take ground fire from an NVA gun emplacement situated on a 2,000 ft. mountain. From my DF station I looked out the window and saw tracers coming up from the ground between me and the wingtip; I knew that usually meant a tracer every fifth round, so there were a lot of machinegun rounds coming our way. 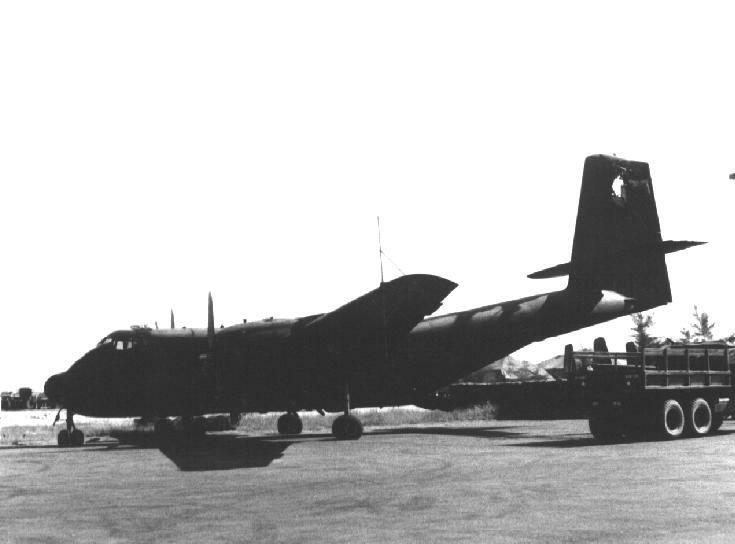 A 37mm anti-aircraft hit our tail; the pilot immediately banked towards the DMZ, was able to skillfully turn the plane without rudder function compensating by alternating the prop pitch, and then landed all of us safely without any combat injury on the PSP-runway at U.S. base Dong Ha, a few kilometers below the DMZ. Below are pictures of our Caribou, crew, battle damage, and "wounded heart" painted on our aircraft by the Crew Chief to indicate battle damage. 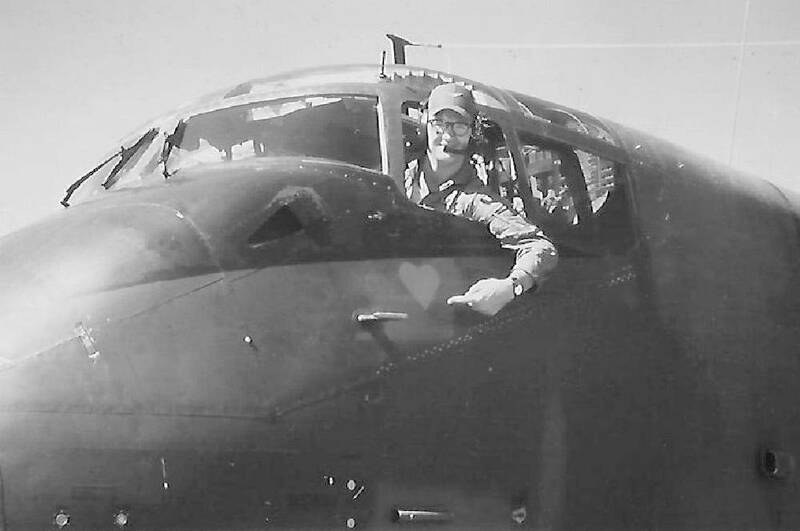 >>> Ken McNamara in Caribou 62-4147 cockpit, indicating “wounded heart” painted by Crew Chief indicating combat damage. 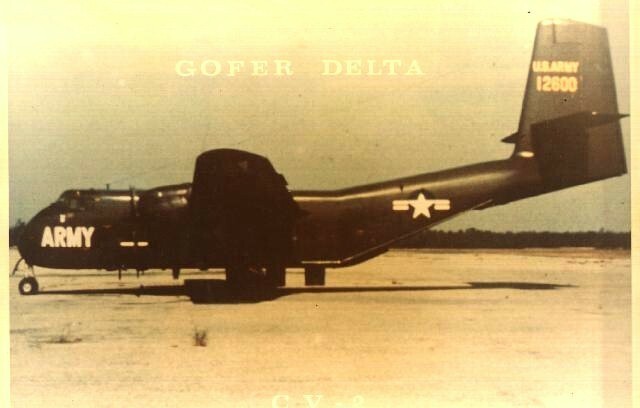 PATHFINDER was a one-of-a-kind HF DF system installed in a DeHavillandRCV-2B Caribou serial number 62-4147 (c/n #82). 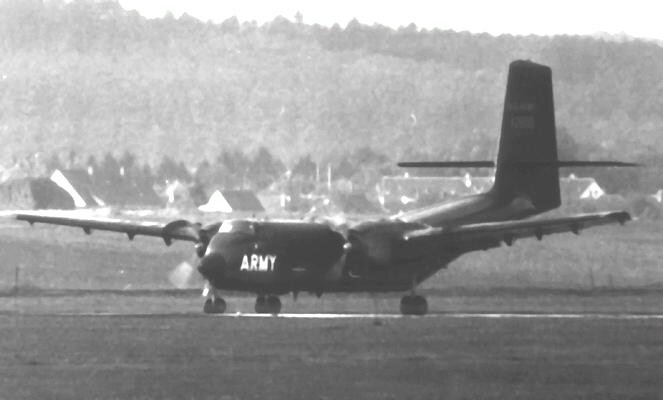 This aircraft was also assigned to the 146th Avn Co (RR) until it was turned over to the USAF in Apr 67. This information courtesy of Dean Haskins who went on to say that the aircraft had battle damage and was turned over to the USAF in 1967 and was eventually transferred to South Vietnam. Robert L. Taylor was kind enough to provide a photo of this battle-damaged aircraft. Note the pre-1962 US Army designation of "RCV-2B" which should have changed to "RC-7B" in that year when the basic aircraft was redesignated as the C-7A/B. 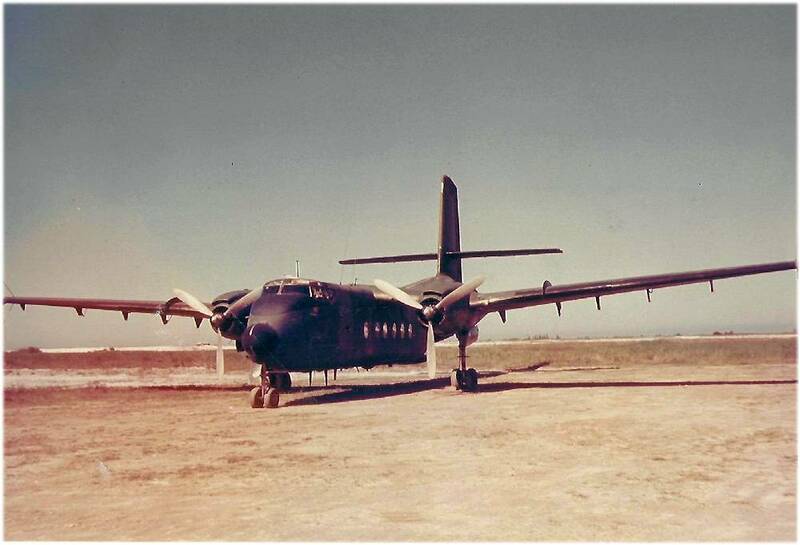 Further note that the designator "RC-7B" has recently been applied to the DeHavilland DHC-7 which is used as the platform for ARL-M.
Richard G. McCarthy had the following to say about this system: "The Caribou was a good system. My memory is a bit hazy about some aspects of the system like how many ops it carried. I seem to remember two pilots, usually a crew chief, a TA guy who was relegated to working the DECCA Nav system and (I think) three ops. Two intercept op and one senior op who was also the DF op. It was noisy like all Caribous and due to the weight it was carrying even slower in the climb than most. I can't remember if it flew the standard four hour mission or stayed up longer. Everything that was painted OD and flew at low altitudes was hot. The Boo had the advantage of space so you could at least stand up occasionally. 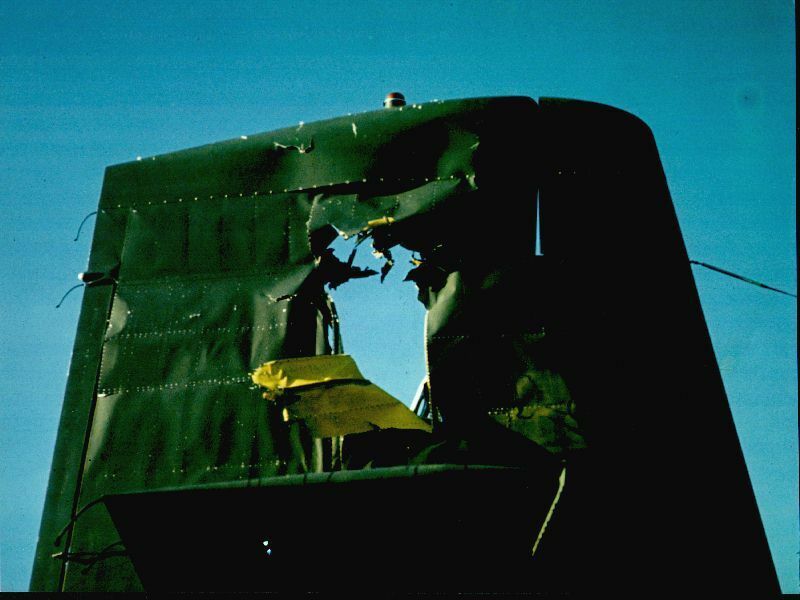 Many times the tailgate was left up for cooling, but this was stopped when one of the PHYLLIS ANN crews (EC-47) lost some COMUS Pad pages out of a open door. Other than the Master Op and TA guy crews were flexible. I flew on it a few times but didn't like it, not because of the system but because of the similarity to field station work. The most disconcerting thing about the Boo was due to the long fuselage you really got slammed around when it was working a target. When we had to turn the Boo over to the Air Force in late 66, all of the mission gear was stripped out ot it and put in a CONEX container. Someone probably bought a complete set of mission gear at a government auction years later, and is probably still trying to figure out what it is." 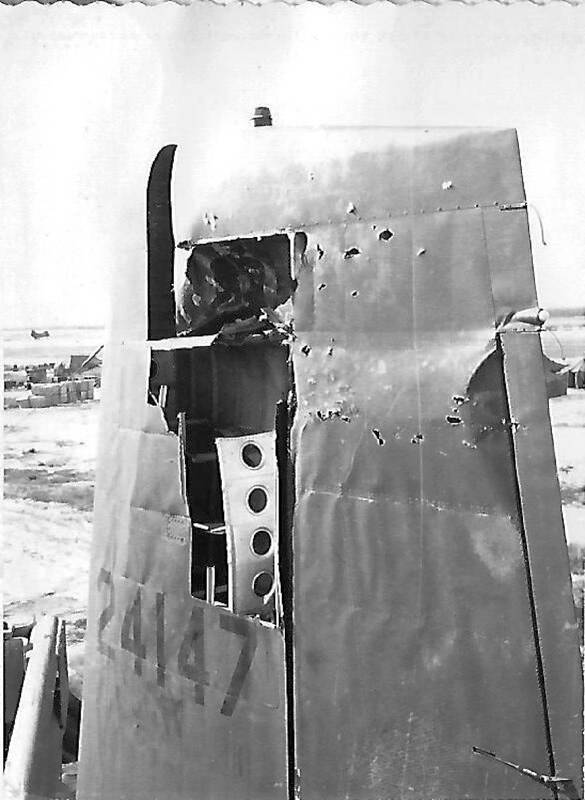 Richard went on to say concerning the battle damage that this aircraft suffered: "At the same time that the 37mm hit the tail (no one in the operators compartment [fuselage] heard or felt the 37mm impact) the belly of the airplane was peppered with .30 cal. at extreme range. Nothing penetrated the skin but the bottom of the aircraft looked like it was attacked by someone with a ball peen hammer. No one took photos of the belly. The boo was working north of the "Z" when it ran into a flak trap. Everything happened at once. The DECCA (Navigation gear) operator told me he looked out of the window and the sky was red with tracers going by. There was a lot of noise from the .30 hitting the belly then it was over. One of the pilots called back and asked if everyone was OK. 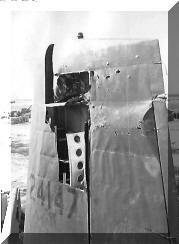 They were aware of the 37mm hit because the rudder was jammed, with only 10 deg travel. They flew back to Dong Ha using differential power and rudder trim. At Dong Ha everyone piled out and was laying on the PSP looking at the belly when they noticed a group of Air Force people staring at the tail with their mouths hanging open. That was the first indication that most of the crew had of the damage to the tail. After a few nervous cigarettes the pilot gave the crew the option of returning to Phu Bai in the Caribou, or riding in the SAR helicopter that would be escorting them. To a man they climbed back in the Caribou for the return to Phu Bai. McKay the crew chief (and a true ASA caracter) who had 75 or 80 sport jumps with the Saigon Sport Parachute Club, donned his parachute and spent the trip setting on the tailgate waving to the crew in the SAR helicopter. Bob Taylor (D.F. Op) took the photos that you and I have after they landed at Phu Bai." Project SURE THING was initiated as an in-house effort by EWL in Oct 65 in response to an ASA request. 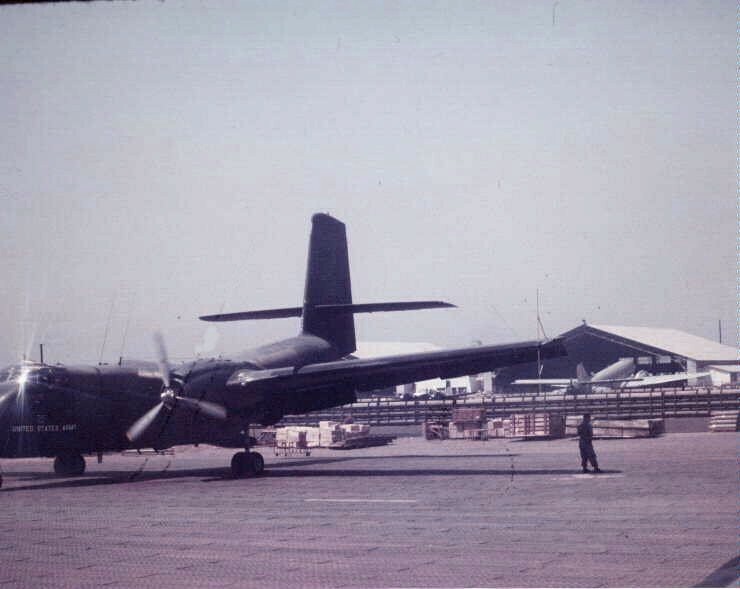 The goal was to configure a CV-2 Caribou 61-2600 (c/n # 78) to provide ELINT coverage from 250 MHz to 26 GHz and COMINT coverage from 20 MHz-2 GHz using off the shelf components. The Bendix Eclipse-Pioneer Division fitted the aircraft with an auto-pilot, and the Ryan Aeronautical Company provided coupling between the auto-pilot and the already installed Doppler Navigation system. The system was shipped to Germany in April 1966 and became operational in June. Don Lewis was good enough to send me a photo of this aircraft and provided the following information: Our callsign was "Surething" There were West German radar sites in the South, but we had to have positive American radar coverage to go South or immediately turn to a heading of 240 degrees and exit the ADIZ. Each month, a scheduling conference was held somewhere in Europe (generally pretty nice places, like London or Paris) where dates, times, and tracks of all NATO surveillance aircaft would be agreed to. If we had an indication that there was some unusual activity across the border, we could request a special mission authorization from the JCS. When we went North, we got linguistic support (German, Russian, Pole) from Herzo Base (318th ASA Bn). When we went South, we got Czech support from the same place. SURE THING had an AN/ALQ-53 and VHF receivers for the voice intercept. Many of the features on the bird were brand new technology and we even had a Ryan Aircraft civilian technician on site to maintain the Doppler navigation system (which was accurate 75% of the time).